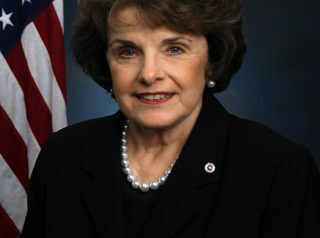 Dianne Feinstein was born as Dianne Emiel Goldman on June 22, 1933 in San Francisco. While attending Stanford University in early 1955, she supported a movement to bring Soviet student-newspaper editors to the U.S. for “guided tours.” Moreover, she hosted Soviet journalists who visited the Stanford campus on an exchange program and was a frequent speaker at events held by the Stanford Political Union, an organization that engaged prominent public officials in policy discussions. Feinstein graduated from Stanford University later in 1955 with a BS degree in history. In 1960, then-Governor Pat Brown (father of another California Governor, Jerry Brown) appointed Feinstein to the California State Board of Parole, a post she held until 1966. In 1968 Feinstein became a member of the San Francisco Committee on Crime, and in 1969 she was elected to the city’s Board of Supervisors (SFBS), where she became president nine years later. While serving on SFBS, Feinstein, a Democrat, ran unsuccessfully for mayor of San Francisco in 1971 and 1975. In December 1973, Feinstein was one of three SFBS members to propose a resolution urging the San Francisco Retirement System Board to completely divest its assets from apartheid South Africa. After San Francisco Mayor George Moscone and Supervisor Harvey Milk were both assassinated at City Hall on November 27, 1978, Feinstein succeeded Moscone as acting mayor. And in January 1979, she appointed the well-known Democratic Socialist Organizing Committee member Harry Britt to succeed Milk. Feinstein went on to serve as mayor until 1988. In 1985, Mayor Feinstein issued a proclamation in support of that year’s World Festival of Youth and Students, a Moscow event which was organized by the Soviet front group World Federation of Democratic Youth, and which was supported as well by the Communist Party USA. That December, Feinstein traveled to Moscow to attend a trade council meeting that called for the removal of restrictions on trade between the U.S. and the Soviet Union. In February 1986, Feinstein was a sponsor of a testimonial dinner in Los Angeles honoring Harry Bridges, a longtime anti-capitalist and suspected Communist who had served as founder and president of the International Longshoremen’s and Warehousemen’s Union. In the late 1990s, Feinstein endorsed a project to create a plaza (with a statue) in honor of Bridges and his legacy. In a 1990 campaign endorsed by the Democratic Socialists of America, Feinstein ran unsuccessfully for governor of California. In 1992 she won a special election for the U.S. Senate (representing her home state) and has been re-elected every six years since then. In early 2013, Feinstein and a number of fellow elected officials and political activists — most of whom were aligned with the Democratic Socialists of America — endorsed a proposal urging President Barack Obama to award a posthumous Presidential Medal of Freedom to the late Fred Ross Sr., a radical who had been trained by Saul Alinsky and had served as a mentor to both Cesar Chavez and Dolores Huerta. In 2015, Feinstein supported the so-called Iran Nuclear Deal whereby the Obama administration and the governments of five other nations agreed to allow the Islamist regime in Tehran to enrich uranium, build advanced centrifuges, purchase ballistic missiles, fund terrorism, and have a near-zero breakout time to a nuclear bomb approximately a decade down the road. She characterized the accord as evidence that Iran’s president and foreign minister “do want to move the country in a more moderate direction.” In 2017 Feinstein asserted that “the threat of a nuclear-armed Iran was finally blocked” by the “historic” deal. While questioning Supreme Court nominee Brett Kavanaugh during his September 2018 Senate confirmation hearing, Feinstein sought to determine whether Kavanaugh viewed the 1973 Roe v. Wade abortion decision as settled law. Said the senator: “In the 1950s and ’60s, the two decades before Roe, deaths from illegal abortions in this country ran between 200,000 and 1.2 million. That’s according to the Guttmacher Institute. So, a lot of women died in that period…. I don’t want to go back to those death tolls in this country.” But the Guttmacher estimate referred to the number of illegal abortions performed each year during the pre-Roe period, not the number of women who died after those procedures. According to multiple estimates, the actual number of women who died due to abortions was less than 1,000 annually. On September 13, 2018 — one week before the Senate Judiciary Committee was scheduled to vote on the Kavanaugh nomination — Feinstein (the Committee’s ranking member) tried to derail the nomination by publicly floating unspecified allegations by an unnamed female accuser who purportedly claimed that the 53-year-old Kavanaugh had engaged in “possible sexual misconduct” against her 36 years earlier, when both were in high school. Feinstein said in a statement: “I have received information from an individual concerning the nomination of Brett Kavanaugh to the Supreme Court. That individual strongly requested confidentiality, declined to come forward or press the matter further, and I have honored that decision. I have, however, referred the matter to federal investigative authorities” — i.e., the FBI. Feinstein had received this letter about six weeks earlier, in July 2018, but had remained silent about it until September 13. A few days later, the woman publicly revealed her name: Christine Blasey Ford. A professor of clinical psychology at Palo Alto University in California, Ford was a registered Democrat who had donated money to Bernie Sanders, ActBlue, and EMILY’s List (nearly four-dozen donations to the latter). In April 2017, she had participated in a so-called “March for Science” in San Francisco, protesting the Trump administration’s alleged plan to cut funding for scientific research. In June 2018, she had joined numerous colleagues in signing onto a Physicians for Human Rights letter demanding that the Trump administration stop enforcing federal immigration laws that sometimes required authorities to separate children from their parents if they were caught illegally crossing the U.S.-Mexico border together. Feinstein has received strong political and financial support from J Street. Feinstein is one of the wealthiest senators in Washington, with a net worth of approximately $94 million as of January 2018, much of it coming from her husband, Richard Blum. For an overview of Feinstein’s voting record on a wide array of key issues, click here. Also during the 1980s, Mayor Feinstein cultivated a close friendship with Shanghai Mayor Jiang Zemin — a relationship that greatly helped the Communist Party of China establish a relationship with the U.S. government. For instance, Feinstein and Jiang visited one another multiple times throughout the ’80s, with Jiang once spending Thanksgiving in San Francisco with the mayor and her husband. Jiang’s ties to Feinstein became particularly significant when the former became General Secretary of the Communist Party of China in 1989, and President of the People’s Republic of China in 1993. In 1994 as well, Feinstein returned $12,000 in campaign contributions from people with connections to the Indonesia-based Lippo Bank, which was an arm of a multi-billion-dollar conglomerate owned by the Riady family, whose members not only had a longstanding relationship with a Chinese intelligence agency, but were also close friends and supporters of Bill and Hillary Clinton. ● In 1996, Newbridge Capital, the investment firm that Blum had formed two years earlier, paid $23 million for a stake in a Chinese government-owned steel enterprise, Beilong Iron & Steel Group, and also acquired large interests in the country’s top producers of soybean milk and candy. ● As of 1997, Newbridge Capital had two investments with partners originally from the China International Trade and Investment Corporation, a $20-billion, state-owned conglomerate that was China’s most influential financial enterprise. ● Newbridge Capital managing director Peter Kwok served as a consultant to a unit of the state-owned China Ocean Shipping Company, which won rights to build a $200-million cargo terminal at the site of the closed Long Beach Naval Station. ● Blum’s largest investment – an estimated $300-million stake in Northwest Airlines, which at that time provided the only nonstop flights from the U.S. to China – was positioned to profit mightily from China’s growth as an economic power. In a March 1997 news conference, Feinstein revealed that the FBI had warned her that the Chinese government might attempt to make illegal contributions to her Senate campaign fund. Only five other members of Congress receive such a warning. From 1997-2005, two of Blum’s companies, URS Corporation and Perini Corporation, had contracts with the U.S. Defense Department – with Feinstein’s knowledge. During those years, Feinstein lobbied Pentagon officials to support certain defense projects that already had been, or eventually would be, contracted out to the Blum companies. Between 2001 and 2005 alone, URS and Perini earned $792 million and $759 million, respectively, from military-construction and environmental-cleanup projects approved by the Military Construction Appropriations subcommittee. In May 2000, Feinstein lobbied in favor of the permanent normalization of U.S. trade relations with China. The subsequent passage of that measure made it possible for China to join the World Trade Organization, a move that Feinstein likewise supported. A spokesperson for Feinstein asserted that the senator’s husband, Blum, had fully divested his holdings in mainland China by 1999, but Blum in fact still owned a stake in a Newbridge Capital Asia fund that contained investments in China. In the same 2010 interview, Feinstein objected to the Obama administration’s sale of $6.4 billion worth of military equipment to Taiwan, characterizing the deal as a “substantial irritant” to U.S.-China relations. In August 2018, media reports revealed that from about 1993 to 2013, a Feinstein staffer named Russell Lowe had secretly worked not only for the senator but also as a spy for Communist China. According to Politico magazine, Lowe, who served Feinstein as an “office director” and “a liaison to the local Chinese community,” was secretly “reporting back” information to Chinese intelligence services during that period. In response to this revelation, Feinstein tweeted on August 4, 2018: “The FBI told me 5 years ago it had concerns that China was seeking to recruit an administrative member of my Calif staff (despite no access to sensitive information). I took those concerns seriously, learned the facts and made sure the employee left my office immediately.” Notably, the senator said nothing about the fact that her office had employed Lowe for almost 20 years and had authorized him to represent Feinstein in interactions with Chinese government officials. For additional information on Dianne Feinstein, click here. Further Reading: “Dianne Feinstein” (Keywiki.org and Biography.com); “Here’s What Dianne Feinstein Said About the Torture Report” (Time, 12-9-2014); “Feinstein Claimed That As Many As 1.2 Million Women Died from Illegal Abortions Before Roe v. Wade” (CheckYourFact.com, 9-7-2018); “Democrats Send ‘Information’ Concerning Kavanaugh Nomination to FBI” (CNN, 9-13-2018); “Sen. Dianne Feinstein Rails against Brett Kavanaugh’s ‘Aggressive and Belligerent’ Behavior” (ABC News, 9-28-2018); “Who Are America’s Seven Richest Senators?” (Investopedia.com, 1-30-2018); “Sen. Dianne Feinstein’s Ties To China Go Way Deeper Than An Alleged Office Spy” (by Ben Weingarten, The Federalist, 8-8-2018); “Feinstein, Husband Hold Strong China Connections” (Los Angeles Times, 3-28-1997); “Husband’s Business Ties Pose Dilemma for Feinstein” (Los Angeles Times, 10-28-1994); “Husband Invested in China as Feinstein Pushed Trade” (San Francisco Chronicle, 10-22-2000); “Senator’s Husband’s Firm Cashes in on Crisis” (Washington Times, 4-21-2009); “A Conversation with Dianne Feinstein” (Wall Street Journal, 6-6-2010).